Arthur Cleveland Coxe – 1849. Dartmoor church bell inscriptions, one may question as to the interest in such a topic but it is part of Dartmoor’s heritage and is certainly one that in normal circumstances remains out of sight in the various church towers of the moor. Is it the case that for centuries these bells have been ‘transmitting’ hidden sentiments alongside their melodic peals? It has been suggested that the use of bells in a Celtic church context dates back as far as the sixth century and by the eighth century were in general use in most churches. By medieval times they served several purposes; to mark the canonical hours, summonsed the faithful to worship, announce the death of a parishioner (the Soul Bell), to mark the Angelus and curfew and to warn of invasion or other such perils, to celebrate weddings, baptisms, feast days, royal births, victories and even defeats in wartime. Friar, p.44. Leaving aside the various technicalities of bells there is one aspect of them which can provide a brief glimpse into the history of each church and the sentiments of the period. Virtually every bell that hangs in the towers of Dartmoor has a legend or inscription on them, some of them record the names of the incumbent vicars and churchwardens at the time of their casting whilst others sport various religious or patriotic verses. The oldest bells tended to simply bear the Latin scripted name of the saint to whom they were dedicated. By the fourteenth century his practice was then followed by various religious lines such as ‘ad laudem‘ (to praise). 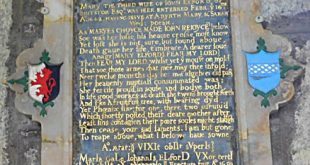 By the late 1600s most inscriptions were equally appearing in either Latin or English and by the mid 1700s many simply used English. Towards the end of the seventeen hundreds there appeared to be a move towards, what at the time, were regarded as ‘vulgar’ inscriptions. This basically meant that there was no religious sentiment involved, such Dartmoor examples being; ‘Thomas Bilbie Collumpton Cast Us All’. Today this would not cause any concern but does demonstrate the piety of the times. I have recently happened upon a book published by the Reverend H. T. Ellacombe in 1872 in which he writes about the church bells of Devon. Between the years of 1864 -65 he visited every bell tower in Devon and recorded the various inscriptions found on every bell (apart from Sheepstor where he could not gain access to the tower). This meant clambering up 456 towers or turrets to achieve his goal which by some of his accounts was a dangerous and due to the bird guano a dirty task. When commentating as to the disrepair met with in some of the towers he remarks; “As for the guano of the daws (jackdaws) and owls, and other birds, it had not apparently been removed for years. Flooring, too, entirely gone, or so rotten as to break away beneath my feet; wet droppings from the roof, and not carefully prevented from driving through the windows.”, p.16. I Call the Quick to Church and the Dead to Grave” which seems to be one of the more popular ones. Other common inscriptions are those that proclaim prosperity and peace to the parish, along with ‘When I call follow all‘ There are several that ask to save or preserve the church and/or king (according to their dates these would refer to King George II or King George III). In normal circumstances inscriptions on ancient bells were generally placed immediately below the haunch or shoulder, although they are sometimes found nearer the sound bow. Please note: T B F means Thomas Bilbie Fecit and I P refers to John Pennington. Apologies for no Latin translations but I was never allowed to stay in French lessons never mind Latin. When looking at the above list it there are two surnames that appear on many of Dartmoor’s bells and they are that of Pennington and Biblie. Both are often preceded by the Latin word fecit which translates as ‘made’ and refers to the two most prodigious bell founders of their time. Thomas and John Pennington’s bell foundry was in Exeter and it’s noted that between 1618 and 1753 the family cast ninety two of the Devon bells. Along with the inscriptions every bell founder also stamped their trade marks and below is that of the Penningtons. It has been said that the Bilbies were all of a wild appearance and could barely read or write as is obvious from some of their inscriptions. They also had a strange way of casting their bells, it was always done at midnight when the moon was full and the weather conditions still and calm. Rev. H. T. Ellacombe 1872 The Church Bells of Devon. Exeter: H. T. Ellacombe. Friar, S. 1996. A Companion to the English Parish Church. Stroud: Sutton Publishing.